“If Superman can fly, so can I” is almost everyone’s childhood wish. The general populace’s younger years are filled with aspirations to someday become the superheroes seen on television. As kids grow older they realize that these heroes are nothing but fictional figures created to inspire young ones to aim for greater heights. While some people take interest on becoming pilots, perhaps to approximate the experience of fictitious birdmen touching the sky, many others prefer to work on the ground. An aviation maintenance technician is an unsung non-flying hero responsible for the safety of all passengers, pilots and crews included, on an everyday flight. As such, it is vital for all aspiring maintenance technicians to choose which among the Aviation Colleges could best equip them with sufficient knowledge and skills required. The broad job description of a technician is to install, inspect, test, adjust, and repair mechanical equipments. In the aviation field, an aviation maintenance technician is to ensure the safety of all passengers by carefully inspecting and evaluating all aircraft prior to take off. Like all other fields, technicians could be general practitioners or may focus on certain expertise otherwise known as specialists. A daily routine includes completing engine changes, trouble-shooting, replacing systems, and partially dismantling aircrafts. It is upon the technician’s discretion to declare an aircraft fit for take off. Knowledge is an essential part of each one’s lives regardless of what career path one chooses to take. The scope of a maintenance technician’s job is nothing compared to the responsibilities the workers in such field bear. It is fundamental therefore for anyone who aspires to become an aviation maintenance technician to arm himself with a good education prior to taking on the job. He must be familiar with the different machines and tools needed for repairing and maintenance. He must also be able to perform routine maintenance and determine what kind of maintenance is needed. Furthermore, the ability to determine causes of operating errors and deciding what solution to make s well as other alternatives. An aviation maintenance technician must also be an active and good listener so that the problems conveyed by others are well taken. Mechanical problems are often complex so a mechanic should have a good sense of analysis and judgement. 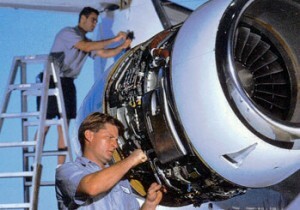 Aviation maintenance technicians do not work alone, therefore a good speaking or communication ability is also required, and so is reading comprehension, writing ability, and must know how to work well with others. Aviation companies hire only those with the right papers for this kind of job. Consequently, certification of a two or four-year degree will be asked so look for a school approved by the Federal Aviation Administration (FAA). This job calls for a lot of experience in manipulation so make sure to check that the school is equipped with state of the art software, tools, and other training equipment. Be aware of the program offered by the school as be aware of the certification pass rates for the aviation maintenance technician course that it has accomplished in the recent years. Many colleges provide job placement services. People spend a lot on education to have a better life and there are numerous Aviation colleges with good reputation which can help one land a job easier.